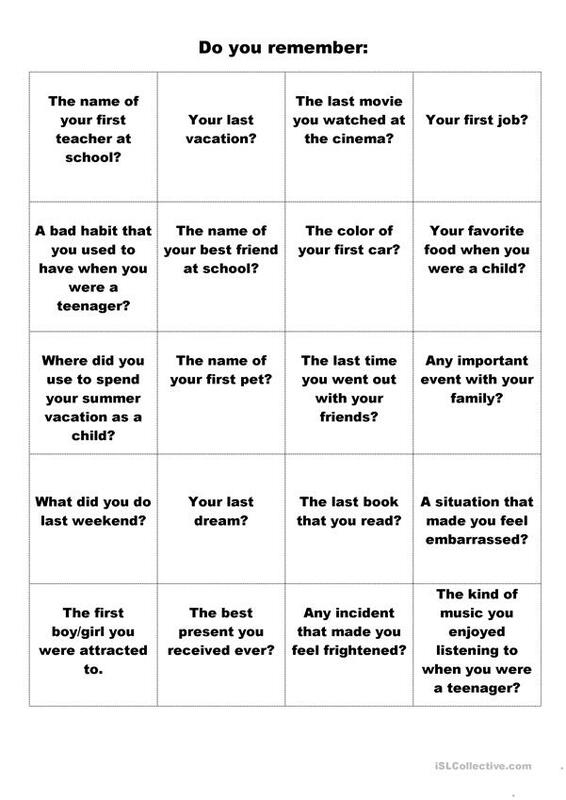 In this activity students practice Simple Past talking about various things they remember from their past. The activity is intended for students with intermediate/advanced English but can be adapted to the younger ones. Teachers can ask each student to get a card and talk about the topic while other students can ask follow-up questions. The above downloadable teaching material is meant for adults at Intermediate (B1) and Advanced (C1) level. It is great for practising Past simple tense in English, and is a valuable material for honing your learners' Speaking skills. BinaBosini is from/lives in Brazil and has been a member of iSLCollective since 2013-07-28 20:24:39. BinaBosini last logged in on 2014-05-01 20:36:48, and has shared 1 resources on iSLCollective so far.